For that personalised touch, we let you build your own Cheese Hamper in a few easy steps making it a very bespoke gift that will delight the lucky recipient. 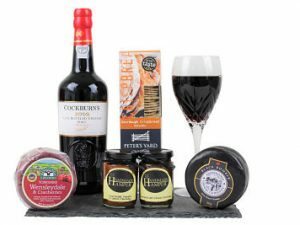 If you’re searching for the ideal personalised Cheese Hamper then you’ve certainly come to the right place, from traditional Cheese and Wine Hampers to Cheese and Port Hampers right through to Cheeseboard selections and alcohol free hampers there’s something for everyone’s tastes. 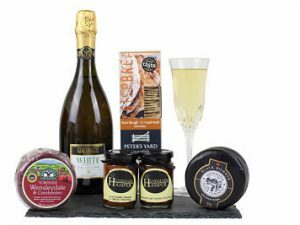 We present a varied mix of wine and cheese hampers to suit a variety of tastes, and will include a diverse mix of complimentary wines, cheeses and tempting gourmet nibbles including Award winning Artisan Crispbreads and Chutneys. All our cheese hampers are beautifully presented and include a personal gift message and hand tied ribbon with bow as standard making an ideal gift for a loved one, colleague or yourself. We also have a selection on non-alcoholic cheese hampers and cheeseboard gifts to cater for everyone. 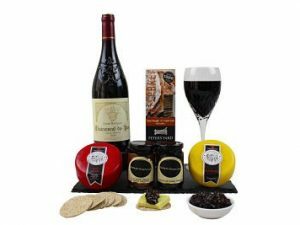 The Alcohol Free Wine and Cheese Gift Hamper is a superb gift. 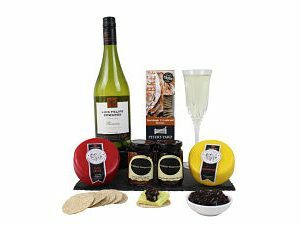 Choose from our delicious Award Winning range of cheese and chutney to accompany the alcohol free bottle of your choice. 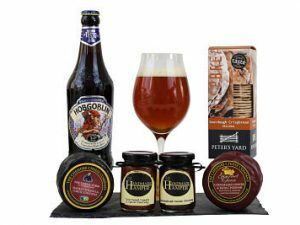 Team your favourite bottle of beer or lager to accompany the Award Winning delights within the Cheese & Beer Gift Box. The perfect gift for any cheese and beer lover! The Cheese & Fruit Gift Box is a delicious combination of mouth watering delights. Perfect for a gift with a difference and full of Great Taste Award Winning delectable treats. The Cheese and White Wine Gift Hamper is the perfect gift of your own creation. 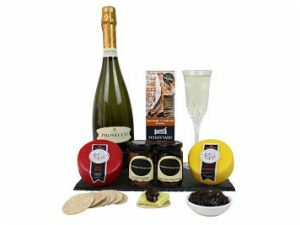 From our superb Award Winning range, choose your favourite cheese, chutney’s and fine wines to make the perfect present. A delightful gift for any occasion. 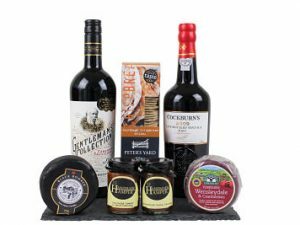 Choose a bottle of your preferred red wine to accompany the vintage Cockburn’s Port within the Cheese, Port & Wine Gift Box. 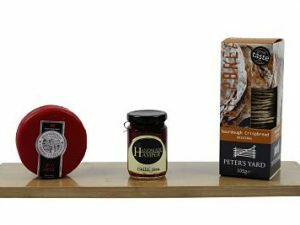 Award Winning cheeses,chutney’s and crispbread from our delicious range allows you to create a bespoke gift of perfection. Choose your favourites from our Award Winning choices to make this Simply Cheese and Chutney Gift Hamper a winning combination by any means. 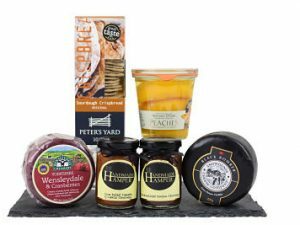 Choose two delicious cheeses from our Award Winning range to accompany the delicious Peters Yard artisan crisp-breads and Handmade Hamper chutney’s. 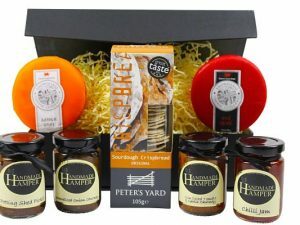 The perfect Cheeseboard Gift Hamper.